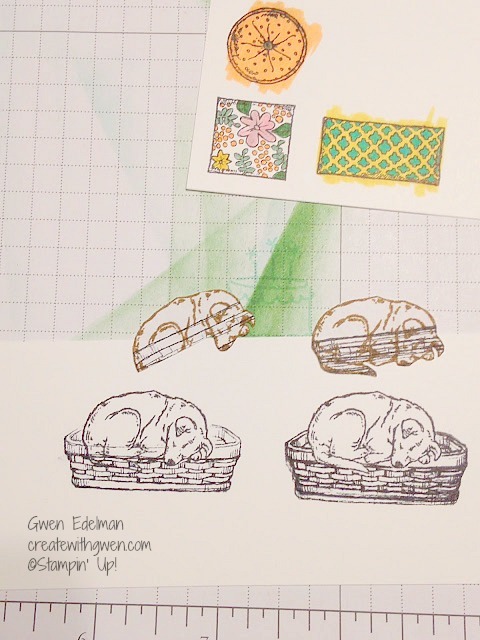 Create with Gwen: Sitting Here Coloring! The coloring craze has been a Stampin' Up! thing forever! A little better than my childhood coloring days, I'd say! I always loved coloring when I was a kid, but stamping and coloring is even better! Here's the card we made at Stamp Club last week. The Sitting Here stamp set is adorable and perfect for coloring. 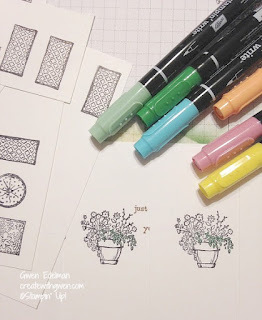 Stamp, color with ink pad and blender pens or Stampin Write Markers, a little fussy cutting, a little sponging with ink and your imagination takes over! The swing was stamped with Soft Suede, embossed the clear embossing powder before coloring with Soft Suede Craft Ink pad and blender pen. The Inside of this card is stamped in Archival Basic Black and then colored in with markers. I actually stamped a few of them to color in later while relaxing just watching TV. The Sitting Here stamp set has so many possibilities to stamp and color! Try the "masking" technique with the puppy stamp (or kitty) to allow them to lay in the basket bed. Stamp the puppy on Whisper White card stock. Stamp again on thin paper like copy paper and then cut out. Place the cut out "mask" on top of the stamped image on Whisper White card stock. Then stamp the basket right over the mask image! Lift the mask piece off and you now have a puppy in his bed! Color, cut out image, and attach to your card using Dimentionals! I am loving those sweet little pillows. This stamp set has endless possibilities! From simple to over the top! Experiment to your taste. Each card-maker has their own style and flair,which is what makes this hobby (or business) of ours so addicting and fun! Enjoy! Products used in today's card: Click image to go there!